This is a great opportunity to try events that you may have never considered before. All competitors score valuable points for the team, whether, you come first or last. 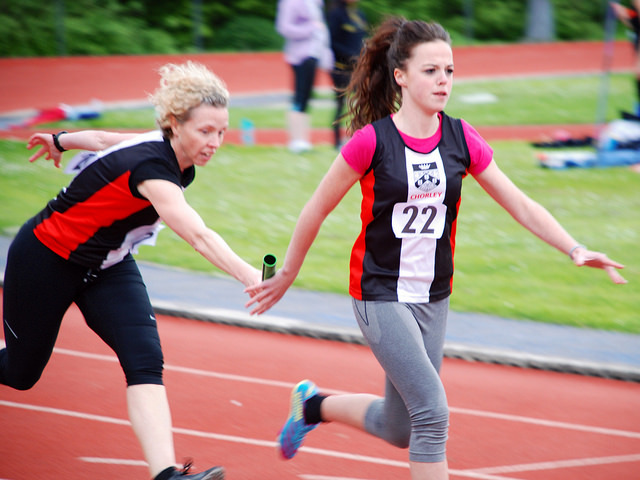 The first Northerns Track and Field competition only attracted 8 athletes, plus some officials, from Chorley. However, the lack of quantity was substituted by quality performances. The 3 young girls of Anna Peers, Holly Brookes and Anya Townsend punched well above their weight in the throwing events. Anna won Discus(30.80m) Shot Putt(9.32m) and Javelin(34.21m) A finals, backed up with Holly taking 1st(20.42m) and 4th(7.13m), and Anya(26.35m) taking 1st in the B finals respectively. Holly and Anya also took 4th and 2nd in the Hammer A and B finals. In addition, Anna and Anya took 4th places in the High Jump(1.10m) and 1500m (6m08s) respectively. Sprinter Andrew Ramsey 4th in 100m(11.4s), 3rd in the 200m(24.2s), backed up with throws in Long Jump(4.75m), Hammer(14.32) and Shot Putt(7.30m). Vet sprinter John Wright took two 3rds in the 100m and 200m B finals, while injury struck Rick Cordwell was restricted to the field events of Hammer(14.68m), Javelin(17.78m), Discus(16.48m) and Long Jump(4.23m). Ben Whipp picked up second in the Javelin(43.93), but won the Discus(31.80m). Vet Simon Townsend struggled for pace against his teenage opponents in the 800m and 1500m recording two 5th places in the A finals. A world best 100m record (11.2s) for Chorley's V55 sprinter John Wright was a great moral boost for the team at the second Northern Athletics Track and Field meeting in Hyndburn. He backed this up with a 24.8s 200m, whilst fellow sprinter Andrew Ramsey stormed a 3rd and 2nd [place in the 100m and 200m A races, plus good results in Hammer, Shot Putt and Long Jump. Hampered by a recurring injury, Rick Cordwell managed a PB in the Hammer, and good points in Javelin, Discus, Long and Triple jumps. Marco Sciacca ran a fine 400m, followed by commendable throws in Discus, Javelin and Shot Putt. Sons Adam and Ryan won the A race and came second in the B race respectively, complemented by a 4th place 5K and 3rd place 800m respectively. 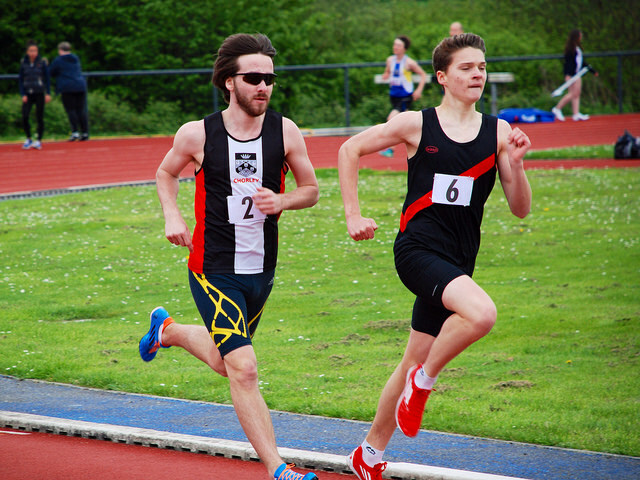 Filling the empty slots in the racing programme, Simon Townsend ran 400m, 800m and 5K to gain a few useful points. Illness and pressures of work, restricted the women's team to Anna Peers and Anya Townsend, but they won A and B discus events respectively. The strong wind in the faces of the throwers, did not prevent Anna also winning the Shot and Javelin, whilst Anya achieved a second in Shot, 2nd in Javelin, 5th in Hammer and 800m. Points were also gained by officials, John, Stuart, Alan, Kath, Simon and Marco, plus a special thanks to Pat Keene for team management. Due to injury and holidays, Chorley's team was a little depleted at the 3rd Northern Athletic 4WC meeting in Hyndburn. Becoming a multievent specialist, Andrew Ramsey came 3rd in the 100 and 200m A finals, and was placed well in the Hammer, Shot Putt and Long Jump. Vet John Wright was placed 3rd, 2nd and 3rd in the 100, 200m and Hammer B finals. Adam Sciacca came 2nd int he 1500m, and also achieved 30m+ throw in Javelin to come 3rd in the A final. His brother Ryan was 3rd and 2nd in the 400 and 800m A final respectively. Father Marco had a spirited run take 4th in the 400m B final. Injured Rick Cordwell still managed to compete in the Triple Jump, Long Jump, Discus, Shot Putt and Javelin events. The mens team was 4th in 4x100m and 3rd in the 4x400m relays. Holly Brookes and Anna Peers were on form again with the field events. Ann won the Discus, Shot Putt and Javelin A finals, and Holly won the Discus and Shot Putt B finals, with a 3rd in the A final of the Hammer and several PBs. Thanks also to Alan, Pat, Ryan, Marco and Simon for officiating/helping on the day.